SUMMER!! It’s the season of the year when we celebrate sunny days, spending time at the beach or outdoors boating, camping, barbecuing with family and friends and we plan family vacations, while the kids are on break from school. For those of us who serve as therapy and nursing providers in skilled nursing, summer also carries with it another meaning. Each year and usually on the last Friday in April, the SNF Notice of Proposed Rule Making (NPRM) is made public by the Federal Government. While we often have ideas about some of the proposed regulations we may find in the NPRM, we also eagerly await the public notice so we can dive in to see if it contains any surprises. We then spend time processing, analyzing and putting together thoughtful comments for the Federal Government to consider before releasing the SNF Final Rule, which is typically published sometime in August. The Final Rule directs our next season of reimbursement and regulatory requirements. The proposed rule Fiscal Year 2019 has been considered by many to be the most anticipated rule proposal since the introduction of the Medicare Prospective Payment System in 1998. The NPRM was released to the public on Friday, April 27, 2018, and introduced us to a new payment model entitled, the Patient Driven Payment Model (PDPM), which is suggested in the rule to become effective in October 2019. CMS further describes PDPM as an innovative new system for SNF payment that ties payment to patients’ conditions and care needs rather than volume of services provided. 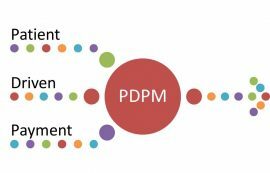 PDPM is proposed to simplify complicated paperwork requirements for performing patient assessments by significantly reducing the MDS reporting burden. The proposed new PDPM is designed to improve the incentives to treat the needs of the whole patient, instead of focusing on the volume of services the patient receives. This approach advances CMS’ efforts to build a patient-driven healthcare system beginning with innovation throughout Medicare’s payment systems. We recognize that under the newly proposed SNF case-mix model, skilled nursing facilities which offer services tailored to individual patient conditions rather than the specific individual services provided by the SNF will become most important. You will want to think more about the outcomes you achieve when treating a patient who has had an acute neurological condition, for example. Do your patients go home more often? Do they improve more significantly? Do they stay free from readmission to the hospital longer after discharge from the SNF? If this model becomes the final rule, data such as this will be more accessible to your patients, allowing them to be more informed as they evaluate their options for post-acute care. As an industry, we have opportunities to be the setting of choice under a value-based model, but we MUST continue our focus on providing interdisciplinary, patient-centered care, while measuring and analyzing our results, and making adjustments where needed. Standardized Tests, interdisciplinary communication, CARE & NOMS data (Section GG), evidence-based practice, reducing re-hospitalization through predictive assessments such as the LACE Tool, better discharge planning and enhanced patient engagement are all the keys to success as the Improving Medicare Post-Acute Care Transformations Act of 2014 continues to make its IMPACT through rules refinement. How will you and your program continue to be the provider of choice in the Healthcare Communities where you operate this summer and all year long—Best in the World!